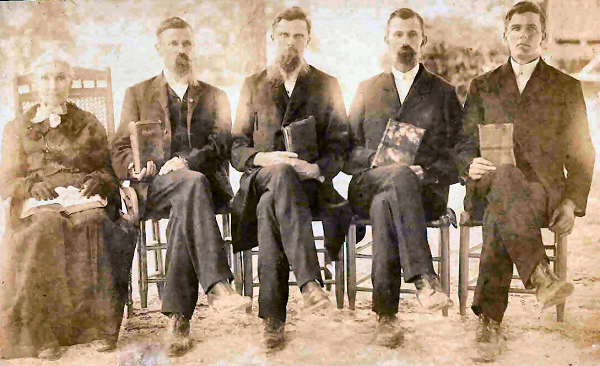 Priscilla Dean Fordham, wife of Ira S. Fordham, and her four minister sons (methodist episcopal church, south), Dennis, Willis, Jerry, and William (L to R). I love this photograph. The lady on the left, Mrs. Prescilla Dean Fordham, was my great great great grandmother. Seated beside her is her son Dennis, my great great grandfather. Of course, his three brothers seated to the right of him were my great great uncles. What I enjoy about this picture is that it tells such a rich story of my own roots. The most fascinating tidbit I know about my great great grandfather Dennis Fordham is that he was present when Louisiana's Methodists decided to create an orphanage. It happened on Saturday morning, December 20, 1902, in Alexandria, Louisiana, during the 57th Annual Conference of the Methodist Episcopal Church, South. Soon after the Conference passed a resolution to establish an orphanage which would become Louisiana Methodist Orphanage (and eventually, Louisiana United Methodist Children and Family Services), Rev. Dennis Fordham was accepted into the Methodist Episcopal Church, South, from the Methodist Protestant Church. Conference Journal of the 57th session of the Louisiana Annual Conference of the Methodist Episcopal Church, South, held in Alexandria, Louisiana, December 18th to 22nd, 1902.